Nearly opaque black garnet color. Bright, earthy, savory aromas of prunes, olives, leather, and light tar and clay with an even, vibrant, dry-yet-fruity medium-full body and a tingling, nuanced, medium-long blackberry-mulberry tart, cherry pit, cocoa dusted nuts, and earth finish with well-integrated, fine tannins and moderate oak flavor. A very Old World, northern Italian-like red blend that will sing like Caruso at the table. Bottom Line: A very Old World, northern Italian-like red blend that will sing like Caruso at the table. 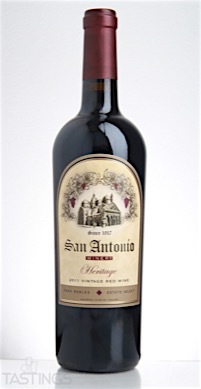 San Antonio 2011 Heritage, Other Red, Paso Robles rating was calculated by tastings.com to be 93 points out of 100 on 5/26/2016. Please note that MSRP may have changed since the date of our review.